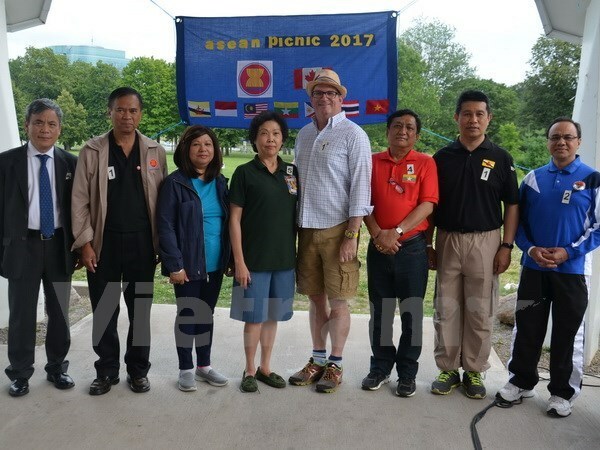 Ottawa (VNA) – The ASEAN festival recently held at Vincent Massey park, Ottawa, Canada, was blazed up with numerous sport events and typical dishes from ASEAN member states. The festival is held annually to strengthen solidarity among the bloc’s members as well as between ASEAN and Canada. This year event drew tens of families of staff from embassies of ASEAN nations and guests from the Canadian Ministry of Foreign Affairs, organisations, universities and colleges. According to Philippine Ambassador to Canada Petronila P. Garcia, rotating chairman of the ASEAN Committee in Canada, the event is of significance as this year is the hallmark of the bloc’s 50th birthday and 40 years of ASEAN-Canada dialogue relations. The committee will hold other activities to celebrate the events, including tree planting at the Indonesian Embassy and ASEAN film festival, the Philippine Ambassador said.